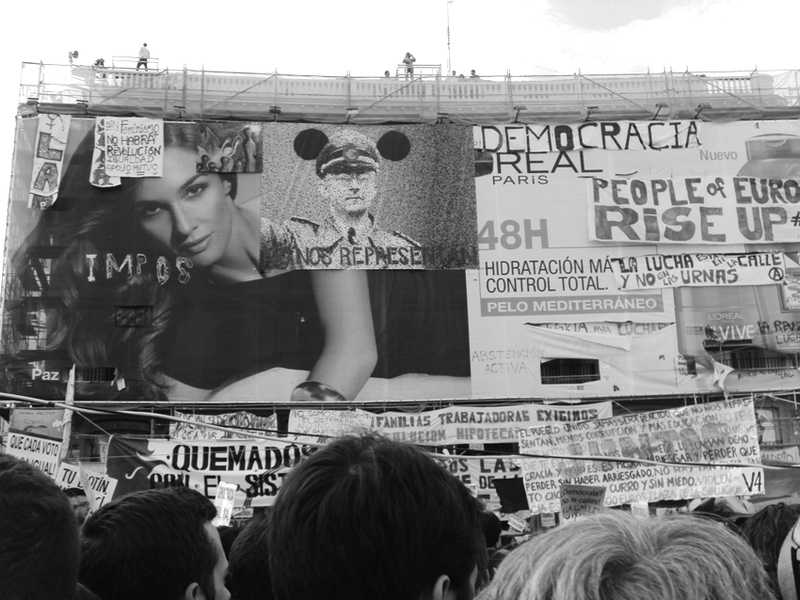 We've all seen what has happened in Madrid on May 15, but perhaps we do not fully understand or appreciate it: the occupation and liberation of the Puerta del Sol has opened a crack in the wall of the established order, routine and even of domesticated common sense through which the spirit of freedom has crept, embodied in the assemblies, committees and the working groups and its horizontal functioning based on the free discussion of the agreements and the rotating delegates, as well as solidarity, real communication and mutual support, in real democracy, in short, which we're trying to reinvent and experiment as the best and most legitimate way to truly take ownership of our destiny, without the dictatorship of money or the tutelage of the politicians. However, this whole process and what still may come next as we so much long for, is based on a principle that we should remember, assume and assert. If we are finally together in this square which no longer is a transit point between the temples of consumption but regaining its vocation of being a free agora and of a heart where the dreams of the city beat, it has been an illegal event which in turn founded a new law: the fait accompli of the occupation of the square as a form of peaceful protest, and the firm and determined consolidation of the occupation despite the eviction of early Tuesday, of the threats and the downpour on Wednesday, of the intimidation of the Junta Electoral and of the heat of the weekend. Because from the point of view of the law of the strongest that rules us today, illegal was the taking of the Gran Via and of other streets and squares after the demonstration on May 15 and the resistance that was initiated, that legitimate expression of accumulated anger for so many days wasted and exploited and for so much sadness, and illegal was the sitting of the protesters galvanized by the revolt on the night of Sunday, and illegal was the tent of Monday and the reconquest of the Puerta del Sol square on Tuesday and the installation of more tents that night... and the preventive concentration preventive on Wednesday against the certainty of a new expulsion that only stopped the tide of illegal people willing to stand up against that law no longer recognized as our... and the height of the illegality was to maintain and strengthen to a point difficult to imagine the camp in a time full of reflection against the barking of the conservative party and the far-right, illegal act if ever that had the courage to reveal and dissolve the immense misery of the electoral campaign that nobody pretended to follow or participate in, because the important and the democratic was being dealt with in the square, and not in the rallies or on television. And indeed, the last straw of illegality is to maintain all this during the very Sunday of the elections and beyond, during the following week, and to call for the extension of the movement and for the creation of neighborhood councils, and for everything that is still is to come and will come. And is it so that the desire for freedom, justice and autonomy asserts itself when it ceases to be individual and helpless to find accomplices who strengthens it against any obstacle. But this can not suffice for us. One of the demands that has brought us to the street and that has nailed ut to it is the housing problem, a fundamental pillar of independent adult life and not of eternal and irresponsible minors, and a housing existence worth living rather than supported. Thus we recall that at this very moment, there are thousands of people languishing in sleeping in the streets, that many others do not sleep at night for fear of eviction, because eviction exists and its terror is wreaking havoc every day and every night; that, finally, many others have lost the dream and the hope of having a place to stay even if in the exile of the suburbs that are built farther and farther from the city we love, or accept the eternal servitude to wild mortgages or the outrageous bleeding of the vampire rents. Yet there are also around our homes houses in good condition, recently completed apartment blocks, premises, cinemas, hotels and abandoned or unused but usable, sleeping, haunted and empty buildings that are available only to the dirty game of speculation, that will awaken when it judges that their value has increased enough. 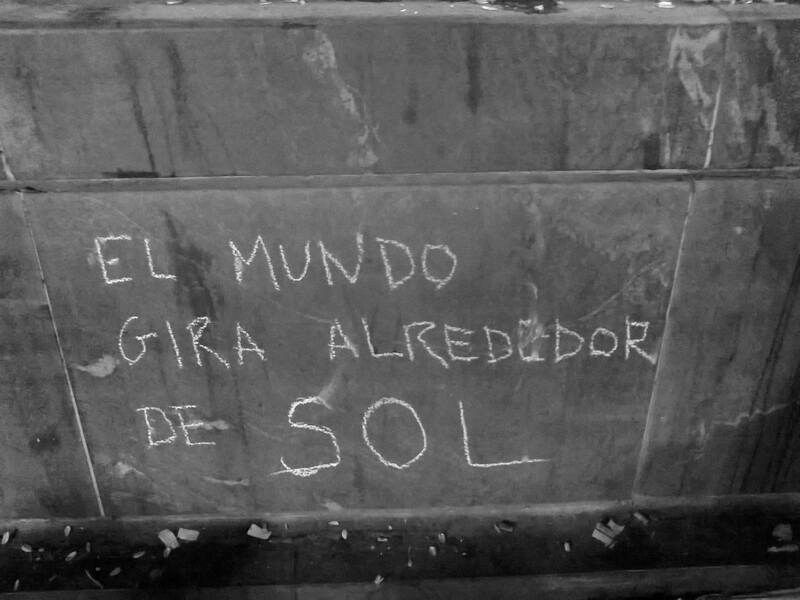 But if we have met at Puerta del Sol, it has been, among other things, in order to denounce speculation and fight it with words and with acts, as we have done with all this square, liberating it from consumerism, of loneliness and boredom by turning it into a melting pot of experiences and projects and into a magnetic furnace where unknown people get to know each others, mingle and merge who before were walking alone to nowhere. Well, we need homes in order to live and to love, and other spaces to continue meet with each others, speak and build the foundations of the new world, and we know how to find these houses and these spaces and what to do with them, and what to do with them, and how to defend, and that it is as legitimate as our dreams and our hopes, since it isn't about being legal or illegal, but about fair or unfair, of necessary or superfluous and harmful as practically everything that they sell and propose us. 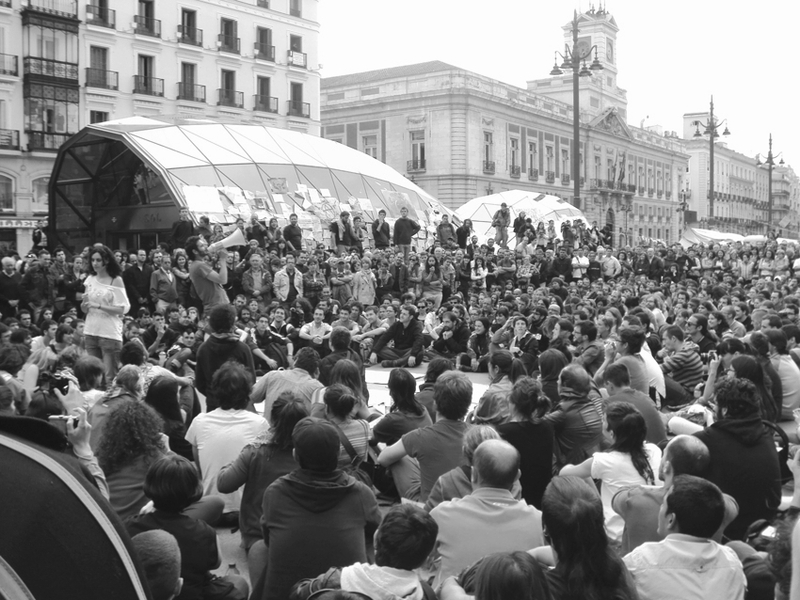 We need therefore to extend the principle of collective liberation that allowed us to re-appropriate from the square to all of Madrid, to all of its unused spaces and places that the economy spoils and that the politicians forget. The squares are to be converted into spaces where politics are being conducted without politicians, we have every right to gather and to demonstrate in public places because these places are the property of the people, and therefore, as has instinctively occurred in Puerta del Sol, the squares should be places devoid of money, without leaders and without merchants, they are the seeds of a new world and the only power that we recognize is the one of the assembly of its neighborhood. But may that desire for freedom not stay there. Because without homes where to live or premises where to meet, there is no real democracy or assemblies or nor any new society worth while. It is about being conscious of our strength and of our desires, and to be consistent with everything that we have done so far, and with everything that we can do and will do. We want it all and we want it now!